While the benefits of course websites have been established at the university level, a paucity of literature exists regarding K-12 teachers' creation and subsequent use of course websites, how they use these course websites, and the factors that encourage, or barriers that impede their use. In this study, 36 inservice K-12 teachers participated in a technology integration course, and as a component, constructed a course website. Ten weeks after the conclusion of the course, the teachers were given an online survey to determine the rate of use of their website. The results showed that due to a number of contextual barriers such as a lack of access to appropriate software, a perception that parents and students cannot access the Internet at home, and a lack of time, over two-thirds of the teachers did not use their course website on a regular basis. In addition, each of the teachers surveyed found the construction of their course website to be a beneficial experience, and the vast majority intended to use it in the future. These results, their implications, recommendations, and directions for future study are discussed. Friedman, A. (2006). K-12 Teachers’ Use of Course Websites. 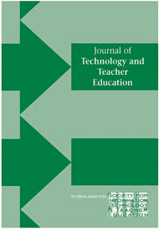 Journal of Technology and Teacher Education, 14 (4), 795-815. Waynesville, NC USA: Society for Information Technology & Teacher Education. Retrieved April 24, 2019 from https://www.learntechlib.org/primary/p/6080/. Essex, C. (2002). Using the Internet in the K-12 classroom: An online course. TechTrends, 46(3) , 23-27. Jones, R. (2001). Involving parents is a whole new game: Be sure you w in! Education Digest, 67(3) , 36-43. Maddux, C. (2001). Solving accessibility and other problems in school and classroom. Rural Special Education Quarterly, 20(4), 11-18. Setoodeh , R . (2004 , September 27) . The connected classroom . Newsweek , 144(13) , 87-88 .